The people taking part in the road trip to Las Vegas as part of the Rightline Gear Jeep Build for the SEMA Show are guys. We don’t need to pack a whole bunch for a road trip. This road trip is a little different, however, in that we will be working in Las Vegas for a whole week before making the long trek back to North Carolina. We actually have to bring a good amount of clothes to look presentable out there. We are going to need some extra cargo capacity to make this plan work. 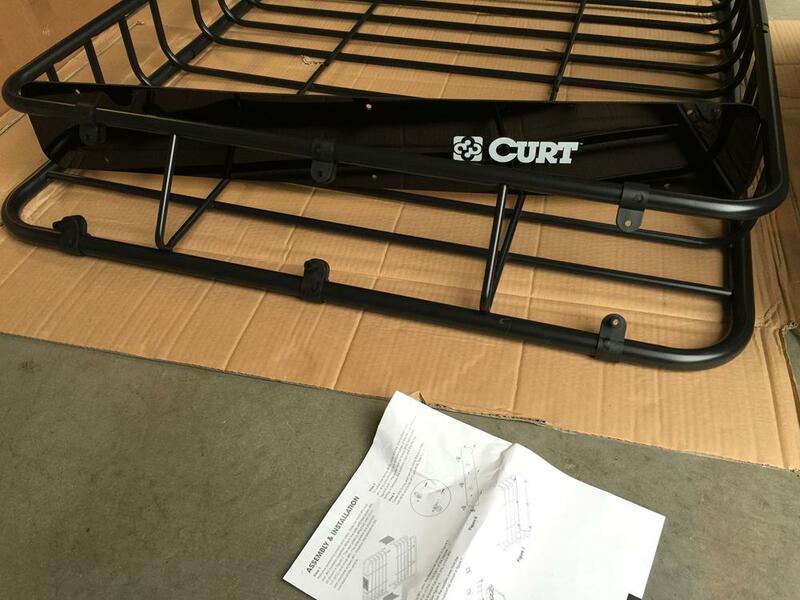 Thankfully, we were able to receive a couple of cargo racks from Curt Manufacturing that will do the trick nicely. 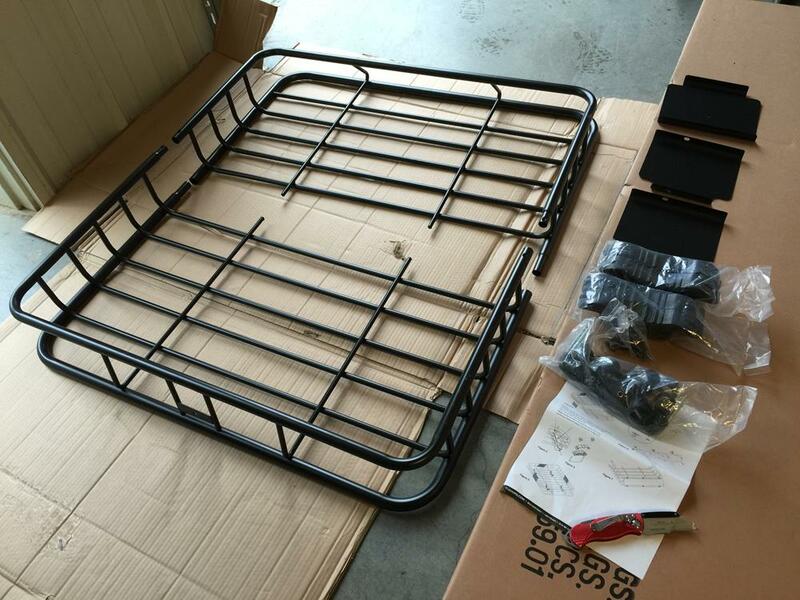 First, I put together the Curt Roof Rack Cargo Basket, Model 18115, to go on top of the Rugged Ridge Exo-Top cage. The carrier comes in (2) parts to allow it to ship in a smaller box. I first bolted on the fairing…. and then bolted the (2) halves of the basket together using the side plates. I installed the back plate on the rear of the Basket. 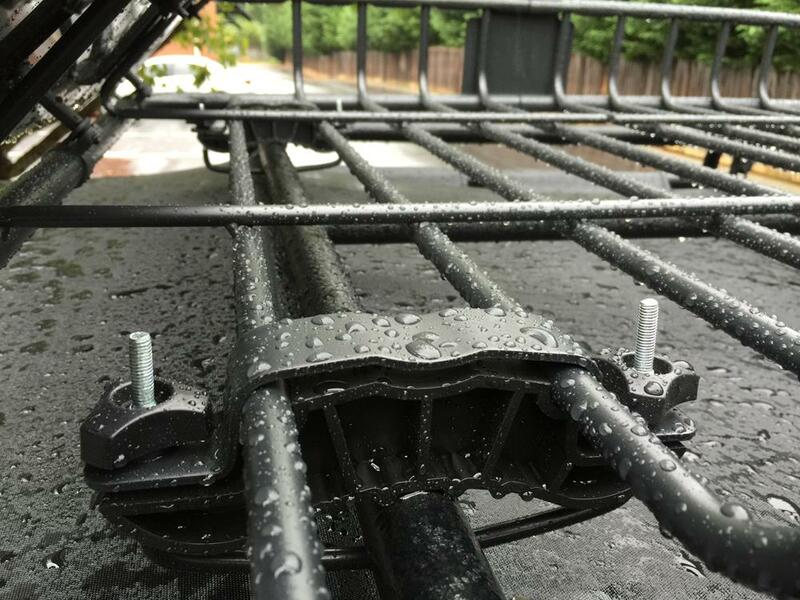 I ran into one difficulty installing the carrier on the Exo-Top instead of on a set of traditional adjustable roof rack cross bars. The front and rear cage bars of the Exo-Top are too far apart for the Curt Basket to attach as intended. To get around the problem, I needed to get a little creative. I installed the front brackets per the directions, clipping (2) of the Basket’s inner frame rods into the brackets. 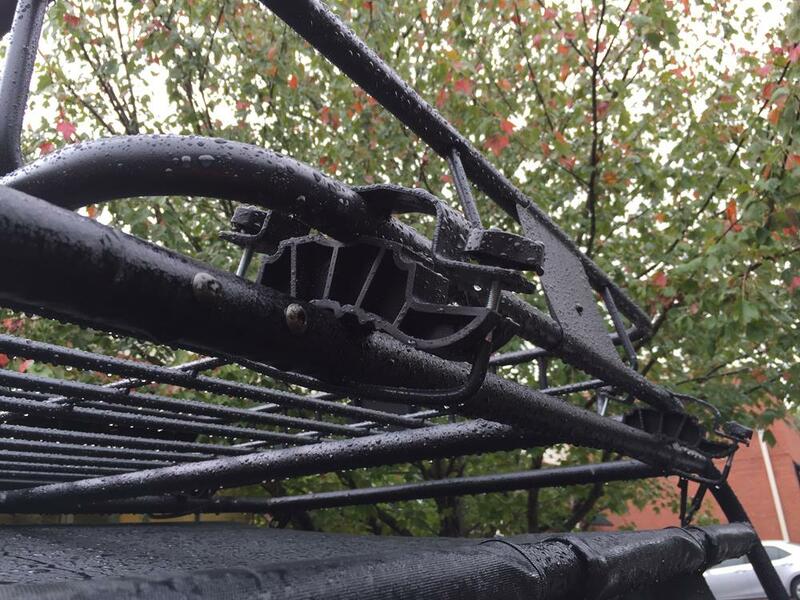 In this position, the Basket’s inner frame rods do not extend as far back as the rear Exo-Top Cage Bar. I decided to try placing the outer frame bar of the Cargo Basket in the middle of the rear brackets instead. 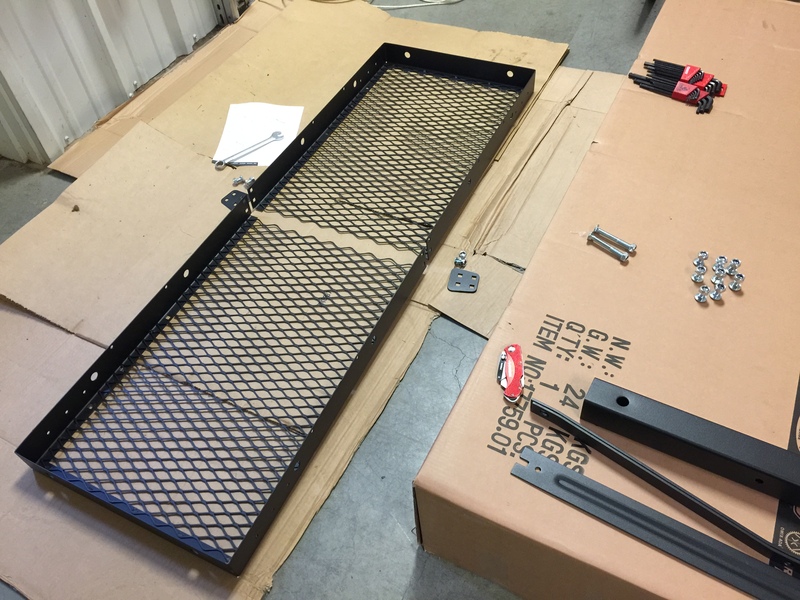 There is a dip in the brackets that is the perfect size to hold the Cage Bar. I tightened the thumbscrews until the metal bracket came down over the frame bar. The bracket is not contoured to follow the curve of the bar, but once tightened down, it held great. The (2) rear brackets ended up being at a downward angle, but they look and function fine. The Cargo Basket is still parallel to the Exo-Top in this set-up. The Cargo Basket looks great – we will just have to watch those drive-throughs with low overhangs – the Jeep with cargo loaded is super tall. Second, I put together the Curt Fixed Hitch-Mounted Cargo Carrier, Model 18108. The Carrier also comes in (2) parts to allow it to ship in a smaller box. I bolted the (2) halves of the tray together and then bolted the hitch bar and its supporting brackets onto the tray. As recommended, it is best to leave the bolts loose until you have everything together. Once I had bolts in every hole, I fully tightened all of them. 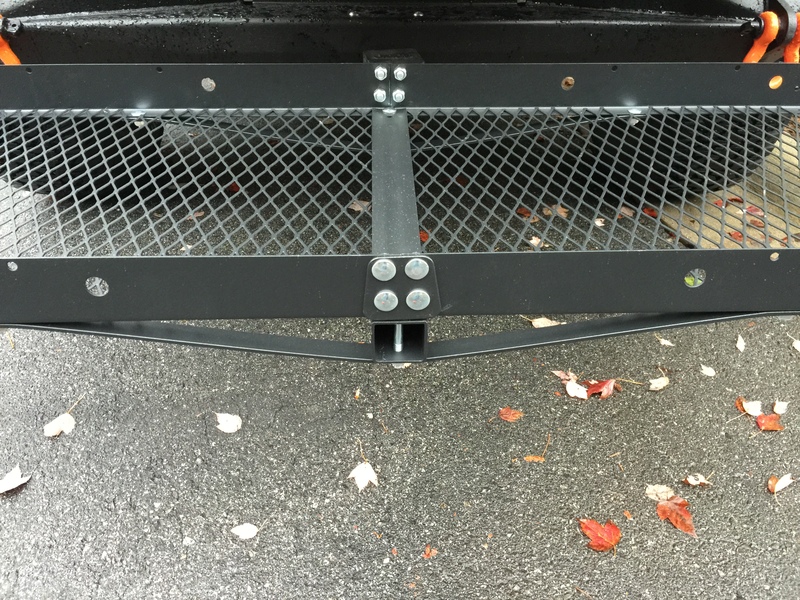 It is amazing that this Hitch Rack can go from a wobbly bunch of parts, loosely bolted together, to a rock solid tray that can hold 500 lbs. 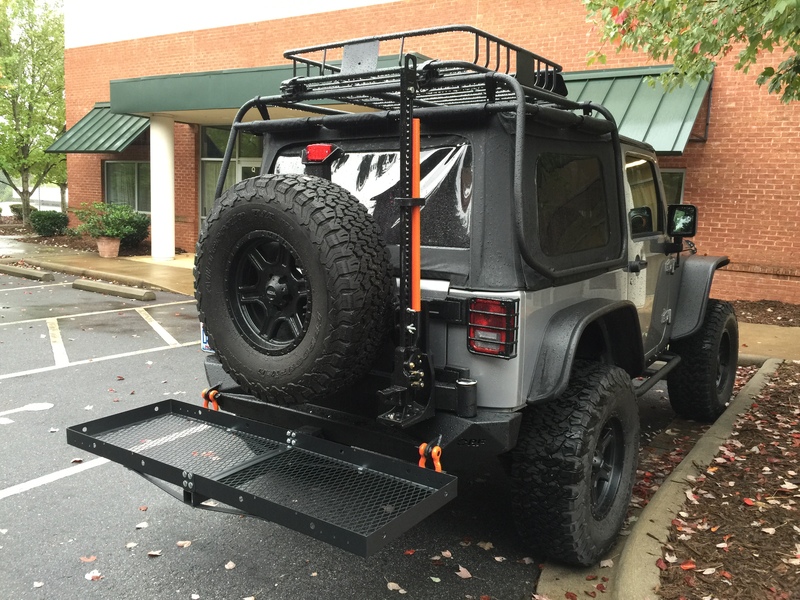 This Hitch Carrier is 20″ D x 60″ W and can hold quite a few of the Rightline Gear Auto Duffle Bags. Between the Hitch Cargo Carrier and the Roof Top Cargo Basket, we should be in great shape. Las Vegas here we come!